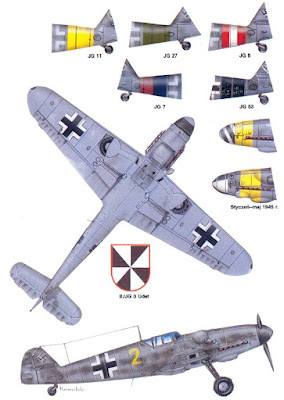 The Bf 109 G-series was developed from the F-series airframe although there were several differences. This series used the 1,475 PS Daimler-Benz DB 605. Modifications included reinforced wing structure, an internal bullet-proof windscreen, the use of heavier, welded framing for the cockpit transparencies, and additional light-alloy armour for the fuel tank and armouring of the radiators. It was originally intended that the wheel wells would incorporate small doors to cover the outer portion of the wheels when retracted. To incorporate these, the outer wheel bays were squared off. Two small inlet scoops for additional cooling of the spark plugs were added on both sides of the forward engine cowlings. A less obvious difference was the omission of the boundary layer bypass outlets, which had been a feature of the F series, on the upper radiator flaps. The "new" Daimler-Benz DB 605A series was a development of the DB 601E engine utilised by the preceding Bf 109F-4. This was achieved through increasing the displacement and the compression ratio, as well as other detail improvements. The DB605 suffered from reliability problems during the first year of operation, forcing Luftwaffe units to limit maximum power output to 1,310 PS (975 kW) at 2,600 rpm and 1.3ata manifold pressure, until October 1943, when the full 1475 PS rating at 2800 rpm, 1.42ata manifold pressure was cleared for service use. 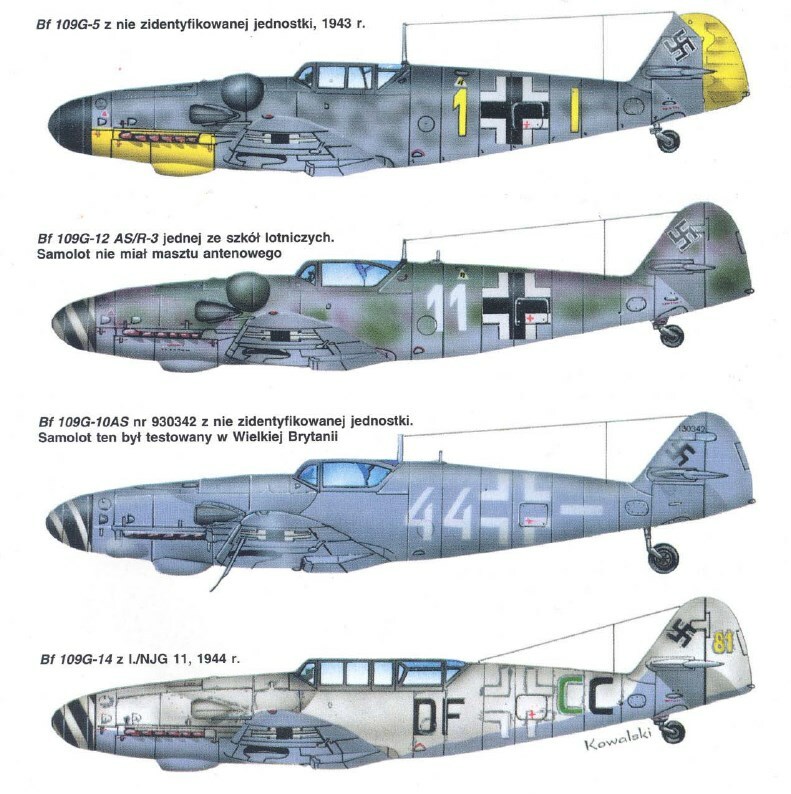 The early versions of the Bf 109G closely resembled the Bf 109F-4 and carried the same basic armament - however, as the basic airframe was modified to keep pace with different operational requirements, the basically clean design began to change. From the spring of 1943, the G-series saw the appearance of bulges in the cowling when the 7.92 mm MG 17 was replaced with the 13 mm MG 131 heavy machine guns (G-5 onwards) due to the latter's much larger breechblock, and on the wings (due to larger tyres), leading to the Bf 109G-6s nickname "Die Beule" ("The Bulge"). The Gustav continued to be improved constantly: cockpit visibility, firepower in the form of the 3cm MK 108 cannon was added to the basic design in 1943, and a new, enlarged supercharger for the DB605, an enlarged vertical stabilizer (G-5 onwards), MW-50 power boost in 1944. 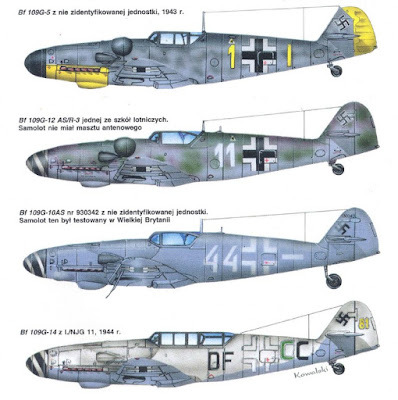 It has been suggested the added weight of the new engines and heavier armament adversely affected the handling characteristics of the Bf 109, especially since it already had a high wing loading. While technically the statement is true, it is somewhat unfair as analysis show only a modest increase in weight as a result of development, fairly comparable to the development trend with Western Allied fighters. From the Bf 109G-5 on an enlarged wooden tail unit (identifiable by a taller fin and rudder with a morticed balance tab, rather than the angled shape) was often fitted. This tail unit was standardised on G-10s and K-4s. Although the enlarged tail unit improved handling, especially on the ground, it weighed more than the standard metal tail unit, and required that a counterweight was fitted in the nose, increasing the variant's overall weight. The G-1 was the first of the G-series, starting production in February 1942. This was the first production Bf 109 with a pressurized cockpit and could be identified by the small, horn-shaped air intake for the cockpit compressor just above the supercharger intake on the left upper cowling. In addition the angled armour plate for the pilot's head was replaced by a vertical piece which sealed-off the rear of the side hinged cockpit canopy. Small, triangular armour-glass panels were fitted into the upper corners of this armour, although there were aircraft in which the plate was solid steel. Silica gel capsules were placed in each pane of the windscreen and opening canopy to absorb any moisture which may have been trapped in the double glazing. The last 80 G-1s built were lightweight G-1/R2s. In these GM-1 nitrous oxide 'boost' was used, and the pilot's back armour was removed, as were all fittings for the long range drop tank. A few G-1s flown by I./JG 1 are known to have carried the underwing, MG 151/20E 20mm cannon gondolas. * G-2/R1: had one 300 litre drop tank beneath each wing, plus an ETC bomb rack under the fuselage, capable of carrying a 500 kg bomb and an auxiliary undercarriage unit beneath the fuselage. * G-2/R2: a reconnaissance aircraft with GM-1 and camera equipment. 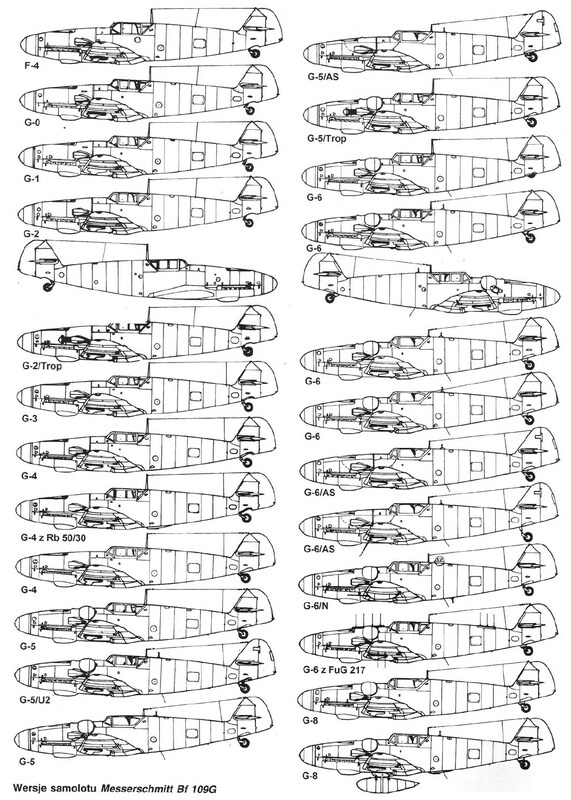 167 G-1s were built between February and June 1942, and 1586 G-2s between May 1942 and February 1943; one further G-2 was built in Győr, Hungary, in 1943. Maximum speed of the G-2 was 537 km/h at sea level and 660 km/h at 7,000 m rated altitude with the initial – reduced – 1.3ata rating. Performance of the G-1 was similar, but above rated altitude the GM-1 system could be used for additional performance: 680 km/h could be achieved at 12,000 meters. In September 1942 the G-4 appeared. It was identical to the G-2 in all respects, including performance, except that the much improved FuG 16 V.H.F. radio set was fitted. Up to July 1943, 1,242 G-4s were produced, and an additional 4 were produced in Győr and WNF factories in the second half of 1943. A pressurized version, G-3 was also produced, being identical to the G-1 in all except its V.H.F. radio set FuG 16. Only 50 were produced between January-February 1943. The G-6/U4 variant was armed with a 30 mm MK 108 cannon mounted as a Motorkanone shooting through the propeller hub instead of the 20 mm MG 151/20. The G-6 was very often seen during 1943 fitted with assembly sets, used to carry bombs or a drop tank, for use as night-fighter, or to increase fire power by adding rockets or extra gondola guns. During 1943, a number of improvements were gradually introduced for the type's benefit: armoured glass head-rest ("Galland Panzer") (early 1943), and the introduction of the clear-view "Erla Haube" canopy (autumn 1943) improved visibility, especially to the rear, and a taller tail unit improved stability at high speeds. The introduction of the WGr. 21 cm under-wing mortar/rockets and the 30 mm MK 108 cannon increased firepower. Certain production batches of the Gustav were fitted with aileron Flettner tabs to decrease stick forces at high speeds. Advanced radio/navigational equipment was also introduced. 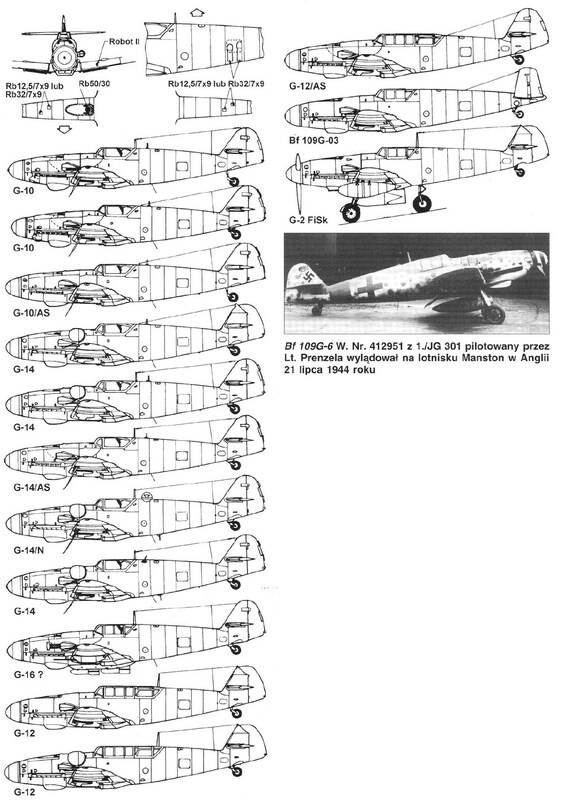 Subsequent Bf 109G versions were basically modified versions of the G-6. Early in 1944, new engines with larger superchargers for improved high-altitude performance (DB 605AS), or with MW-50 water injection for improved low/medium altitude performance (DB 605AM), or these two features combined (DB 605ASM) were introduced into Bf 109 G-6. Maximum speed of the G-5/G-6 was 500-510 km/h at sea level, 625-630 km/h at 6,600 m-rated altitude using the restricted 1.3ata boost, and when using the full 1.42ata boost 530 and 640 km/h respectively. Figures are without MW-50 or GM-1 boost. The G-8 was a dedicated recon version based on the G-6. The G-8 had often only the Motorkanone engine cannon or the cowling machine guns installed and there were several subversions for short or long range recon missions with a wide variety of recon cameras and radios available for use. The G-14, appearing in mid-1944 was basically a late-war Bf 109 G-6 with the aforementioned improvements standardized, and with MW 50 methanol/water injection increasing output to 1800 hp being a standard fitting. High-altitude models of the G-14 received the DB 605ASM engine and were named G-14/AS. There was increasing tendency to use wood on some less vital parts (e.g. on a taller tailfin/rudder unit, pilot seat or instrument panel) - not because of the shortage of strategic materials like aluminum as often suggested, but as it allowed freeing up metalworking capacity by involving of the woodworking industry of more parts. The G-10 was an attempt to match the proven Bf 109 G-6/G-14 airframe with the new and more powerful DB 605D engine with minimal disruption of the production lines. Despite what the designation would suggest, it appeared in service after the G-14 and somewhat the K-4 in November 1944. Early production G-10s used fuselages taken from the G-14 production lines, this was probably a source of confusion as many authors still believe many G-10 were based on recycled G-series fuselages. The most recognizable change was the standardized use of the "Erla-Haube" canopy, sometimes referred to (incorrectly) as the "Galland" hood. This canopy improved the pilot's view by reducing the number of support struts, which was often criticized before. The G-10 was produced in very substantial numbers, with some 2,600 G-10s produced until the war's end. 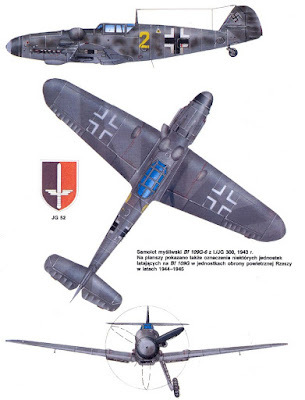 The Bf 109 G-10, AS-engined G-5s, G-6s and G-14s as well as the K-4 saw a refinement of the bulges covering the breeches of the cowl mounted MG 131, these taking on a more elongated and streamlined form, barely discernible on the upper sides of the cowl panels, as the large engine supercharger required a redesign of the cowling. A similar varying product was the Bf 109 G-12. This was a two-seat trainer version of the Bf 109 and was rarely armed with anything more than the two cowling machine guns. The space needed for the second cockpit was gained by reducing the internal fuel capacity to only 240 l thus they nearly always used the 300 l drop tank as standard equipment. The G-12 was built using a wide variety of G-series fuselages, many were G-2 based but several were built of rebuilt/repaired G-1, G-4 and G-6. We do not have any documentary evidence that Hartmann ever flew a Bf 109K. There are numerous color sideviews of his supposed last aircraft depicted as a K with the dopplewinkle, a wreath on the rudder with "300", supposedly marking his 300th victory, and then 52 more kill bars. 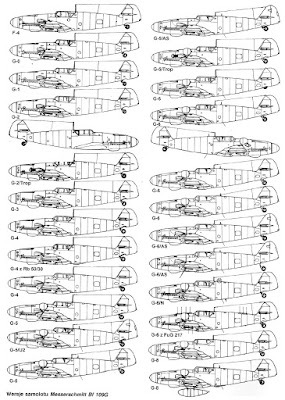 This sideview has been repeated ad infinitum based on a drawing in one of Karl Ries' Luftwaffe Camouflage and Markings books. Based on current knowledge this sideview is fiction. While there may be a possibility of him flying a K-4, there is no documentary evidence that he did. 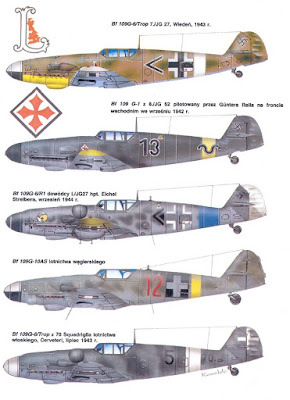 Indeed, I./JG 52 flew mostly G-14 and G-10 aircraft in the last months of the war. The list of losses by the gruppe is, at best, rather incomplete. There are some half dozen K-4 losses listed in Fast's history of the Geschwader, some confirmed by the Quartermaster lists. The nearest thing to a "last" aircraft flown by Hartmann we have is a photo of him next to a G-10. This aircraft is shown from the supercharger back to about frame 3. We can see that it is the "square panel" type G-10 built by Erla. It could be in the 150xxx or the 490xxx ranges. We can see the famous heart emblem with his wife's name under the cockpit. Also, we can see the front part of the doppelwinkle. It appears to be either in gray or light green, outlined in white. You can see this photo in B. Barbas' Aircraft of the Luftwaffe Aces. Other than this, we do not know what any other markings looked like. The time period of the aircraft appears to be in the spring of 1945. 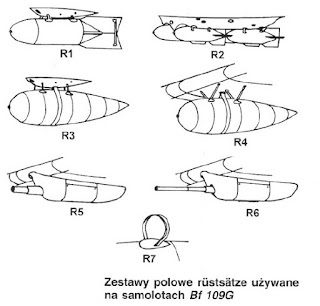 Messerschmitt Bf 109 F, G, & K Series: An Illustrated Study by Jochen Prien and Peter Rodeike has some good photographs of erla haube canopies retrofitted to Bf 109G-6's; these show good detail of the hardware needed for this conversion. 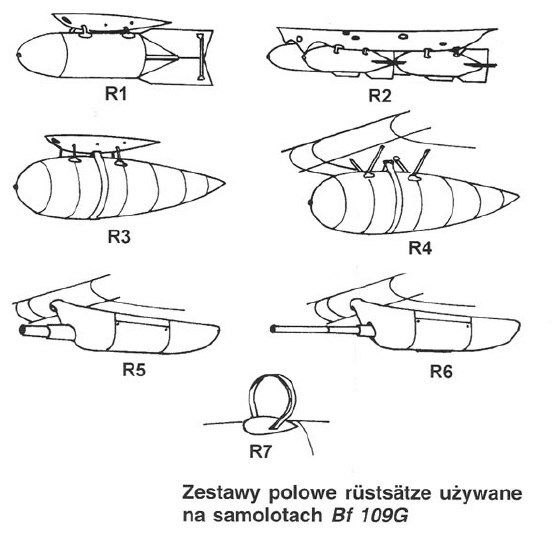 Some G-6, G-8, and virtually all G-14 and G-10 aircraft were fitted with the so-called "Erlahaube" (made by Erla). There was no separate R or U designation for this canopy. Some G-6 and G-5 were retrofitted and the attachment details are slightly different. Basically, the Erla Haube was built in two versions: The REPLACEMENT TYPE used the existing three-piece hood's mounting hardware. The PRODUCTION TYPE did away with the old mounting hardware. There are visual cues which easily differentiate which type of Erla Haube you are seeing, but they are too complicated to discuss here. Further, each type of Erla Haube had one or two possible antenna mast attachments. The Erla Haube was retrofitted to Bf 109G-6's. 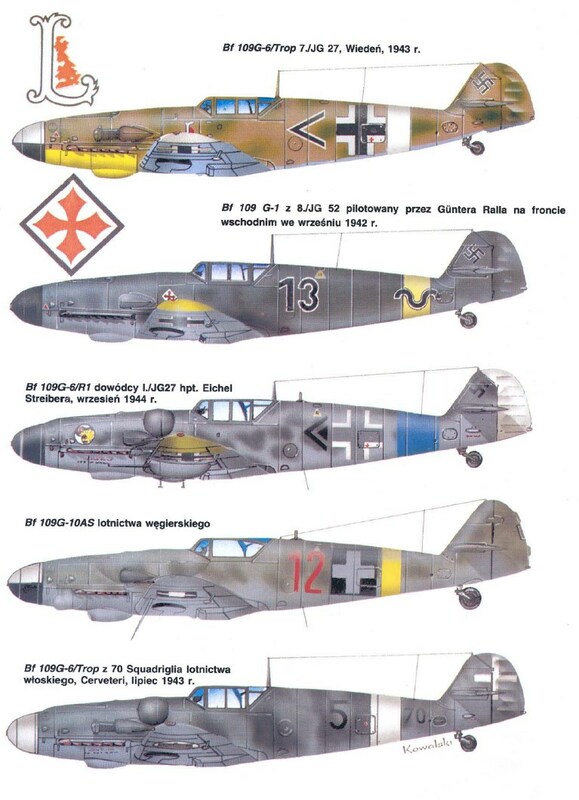 It was standard equipment on late-build Bf 109-6's, and later versions of Bf-109's (G's and K's).